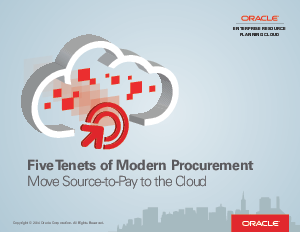 Modern procurement requires source-to-pay technologies that run in the cloud and utilize modern technologies such as embedded analytics, support for mobile devices and deep embedded social collaboration to help people work more effectively together, and streamline processes. In order to ensure that your modern procurement solution supports a modern approach, we've outline 5 primary tenets of a modern procurement solution that together provide a richer employee experience, collaboration that streamlines processes and increase efficiently and insight that guides decisions at all phases of the process. Modern procurement solutions must be strategic, insight driven, collaborative, ultra-efficient and in-control and compliant.